Beautiful 7 Bedroom 6 bathroom Direct Ocean Front South Forest Beach Home with private pool! When life gets hectic and your thoughts say "Take Me Away", this is the place! Direct oceanfront on beautiful South Forest Beach is the setting for this Charleston-style, 7 bedroom, 6-bath, premier Hilton Head Island home. At ground level are double garages on either side of an informal play room that has both a ping pong table and a game table. The raised 1st floor, with the main living areas, is high enough to look over the dunes and provide breathtaking ocean views. At the oceanfront side of the 1st floor is a large great room, which includes a state-of-the-art kitchen, a breakfast area, a formal dining area, and a spacious living room. The kitchen is defined by a large circular counter with 5 barstools, and features stainless steel appliances, a center island cooktop, wall ovens, and a built-in wine cooler. The breakfast area has a table for 4 and the formal dining area has seating for 10. 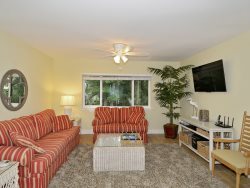 In addition to the comfortable furnishings, the living room has a TV/VCR & CD system. Three sets of French doors span the length of the front wall and open to a raised deck, which features a large swimming pool, a spa pool, both which can be heated for additional fees and the gorgeous view. The 1st floor also has bedroom #2 with a king-size bed, and a private bath, bedroom #3 with 2 twin beds, a hall bath, and a hall closet with a stack washer/dryer. On the 2nd floor are the master suite, 4 additional bedrooms, a hall bathroom, a 2nd stack washer/dryer, and an alcove in the hallway with a bar sink and a compact refrigerator. The master suite features a king-size bed, a TV/VCR, 2 sets of French doors to an upstairs balcony overlooking the ocean, and a private bath with a Jacuzzi tub, a glass walk-in shower, and double vanities. Bedroom #4 has a queen-size bed, a TV/VCR, and a private bath. Bedroom #5 has a queen-size bed and a connecting door to the hall bath. Bedroom #6 has 2 twin beds and a private bath, and bedroom #7 features 2 twin beds and a TV. Everyone was very responsive and professional. The property was beautiful and felt like home. Staff was extremely proactive and friendly...they answered our questions before we asked them...we never had any worries. We love this property and have stayed there twice with 100% enjoyment and relaxation. The week always goes by way too fast! Your team is excellent! Thank you all so much. We enjoyed our stay. Your staff made reservations, arrival and departure a breeze. The house was great. We had a wonderful time overall! The house was great!